Often people ask, “Why are there poisonous plants?” or “Why would God create poisons?”. While this could prove another very complex discussion, it’s sufficient here to point out that even the most poisonous plants have medicinal uses. In fact, it is precisely the poisonous plants that have provided the most powerful and dramatic medicines- they are poisonous or medicinal because their chemical constituents are so strong. So, everything has its place. 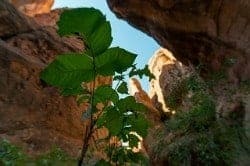 The survivalist should get to know the most toxic plant families to avoid accidental poisoning and to become familiar with the myriad uses of such plants. There are certain generalizations that the botanist can make regarding the identification of plant families. Likewise, there are generalizations that the forager and herbalist can make about the edible, medicinal, and toxic properties of plant families. This is very useful for plant identification and use of plants for food and medicine. However, while generalizing is useful for learning – it is not the full story and one must also learn the details. The Carrot Family (Apiaceae), for instance, is one of the most poisonous plant families that also gives us Carrots, Parsley, and other well-known edibles. The forager should know that the family in general is quite toxic. But they must also learn which species are good edibles, which have medicinal properties that are also somewhat toxic, and which are fatally poisonous. Learn the ends of the spectrum first- the most edible and the most poisonous. One could argue that the safest method to learning about wild edibles is to learn the most deadly poisons first. Then, one would know what to avoid to avoid death. All other mistakes would be mild in comparison. This is good theory, but in reality it is much more common and natural to learn a little bit here-and-there about edibles, medicinals, and poisons. Still, the point has been made. Because of the “spectrum of edibility” an exhaustive article on plant poisons would be very long. For this post we will focus on five plant families of common occurrence and some of the most deadly plants. This will be a good starting place for the subject. The five families covered are the Poison Ivy Family (Anacardiaceae), the Carrot Family (Apiaceae), the Milkweed Family (Apocynaceae), the Buttercup Family (Ranunculaceae), and the Nightshade Family (Solanaceae). Anacardiaceae is also known as the Cashew Family. Poison Ivy (Toxicodendron radicans) is a complex species group that may or may not include what is otherwise known as Poison Oak. They deserve mention here not only due to “poison” in their name but because these plants are among the most trouble to people spending time outdoors, some people anyway. A decent percentage of people can react to the Poison Ivy oils and experience a troublesome, blistering rash. Some people do not react, but must still maintain some respect for the plants as sensitivity can develop at any age. People also lose sensitivity spontaneously or through desensitising protocols. The best remedy for the Poison Ivy rash is fresh Jewelweed (Impatiens spp. or Touch-Me-Not). The juicy plants can be crushed and rubbed on the exposed area. You should learn Poison Ivy and its relatives as well as Jewelweed. Poison Sumac (Toxicodendron vernix) is another in the genus. 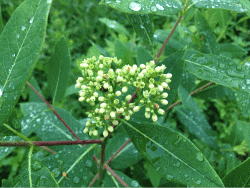 Sometimes when people get a bad Toxicodendron rash they will say it is Poison Sumac because of how bad the rash is. However, because Poison Sumac grows in swamps and bogs it is much more rare to come in contact with. Mangos (Mangifera indica) and Cashews (Anacardium occidentale) belong to Anacardiaceae, as do our Sumacs (Rhus spp.). It is believed that eating these foods can help against Poison Ivy reactiveness. People sometimes worry about consuming Sumacs because of Poison Sumac. But Poison Sumac belongs to Toxicodendron and Staghorn Sumac and its close relatives belong to Rhus. They are different plants. Rhus species provide several edible and medicinal parts. Apiaceae is also known as the Poison Hemlock Family, the Parsley Family, and by its old name, the Umbel Family or Umbelliferae. This latter designation has persisted since Apiaceae became official largely because it describes the flower type, the umble, which is characteristic. To describe it here is slightly too technical (will save it for an article focused on this family alone), but perhaps you already know it. Carrots (Daucus carrota), Angelica (Angelica spp. ), Parsnips (Pastinica sativa), Dill (Anethum graveolens), Poison Hemlock (Conium maculatum), and Water Hemlock (Cicuta spp.) all have umble (umbrella-shaped) flowerheads. Yarrow (Achellea millefollium of the Aster Family) and Elderberry (Sambucus spp. of the Elder Family, Adoxaceae) look at first to have umbels, but when inspected closely the stalks supporting the flowering parts arise in a branching pattern from the main stem while true umbles branch from a single node of the main stem. That is, umbels come from one point. Poison Hemlock, Water Hemlock, and the related species are very deadly. Water Hemlock (Cicuta douglasii) has been considered the most poisonous plant in North America. 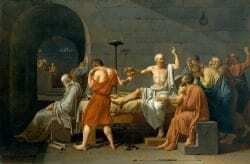 Poison Hemlock is infamous as the plant that killed Socrates, as it was used in ancient times as a euthanizing agent. Umbel flower-heads should be a warning. Eat and use such plants carefully to avoid confusing a desired species with a fatally poisonous one. Even those that are edible can produce toxic parts. For instance, Parsnip has been cultivated for generations as a delicious vegetable, but the above-ground portions of Wild Parsnip are well known to produce rashes in some people. Like Parsnip, Wild Carrot is the wild version of the domestic vegetable (same species). It is one of the most commonly consumed vegetables around the world. Some people cook with the greens as well. However, it is not considered safe to freely eat the greens or seeds in that there are some toxic properties. Apocynaceae is also known as the Dogbane Family, especially since Milkweed was formerly classified in Asclepiadaceae (the families have been merged). I call it the Milkweed family because Milkweed (Asclepias spp.) is a much more commonly known plant and because I often teach about the edible properties of it. Dogbane (Apocynum spp.) is commonly known as the poisonous relative of Milkweed. 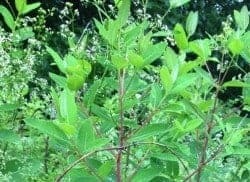 Besides the toxic properties of Dogbane, the survivalist should get to know the plant as an important source of fiber for cordage. A common species A. cannabinum is sometimes known as Indian Hemp (which is referenced in the species name that refers to Cannabis) because it was a primary fiber plant. In spite of being named after a food, Buttercups (Ranunculus spp. ) are generally toxic. One species, Marsh Marigold (Caltha palustrus) is a well-known edible (must be cooked properly), but the family should be treated with caution. It would be another whole article (or should I say will be another blog) to discuss the range of toxic plants of the Buttercup Family, from the Common Buttercup (Ranunculus spp.) to the “most deadly plant” in the world – Aconite (Aconitum spp. ). If you live in an area where Aconite or poisonous relatives like Larkspur (Delphinium spp.) grow, you should learn these plants. Aconite is also known as Monkshood and Wolf’s Bane. Another member of the family is known as Baneberry (Actaea spp.) In my area we have Red Baneberry (A. rubra) and White Baneberry, or Doll’s Eyes, (A. pachypoda). It has created some confusion since Black Cohosh, formerly Cimicifuga, was included in the genus, and some concern since the common medicinal is not as toxic as the Baneberries. 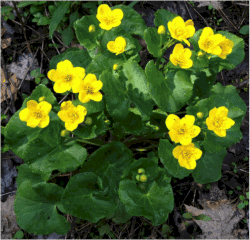 Ranunculaceae is also known as the Crowfoot Family. Members of the family are quite common, especially in wet areas. Often, they go unnoticed when not in flower. It is worth learning the leaves, by which they get the name Crowfoot. Even Ranunculus species can blister your mouth if chewed on. There are also important medicinals in Ranunculaceae, like the famous antibiotic herb Goldenseal (Hydrastis canadensis). This is one of the most famous and controversial plant families. While there are still many more families to discuss (such as the Lily Family, Liliaceae) in our exploration of poisonous plant groups, it is fitting to close with such an interesting group. Solanaceae produces deadly poisons (hence the name “Deadly Nightshades”), hallucinogens (like Jimson Weed and Belladonna), food crops (like Potatoes and Tomatoes), and other exceptionally interesting plants (such as Tobacco). Jimson Weed (Datura spp. 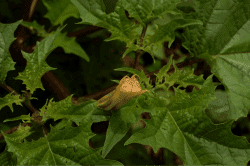 ), Deadly Nightshade (Atropa belladonna), and other similar plants are very toxic. They have been associated with Witchcraft, crime, and other dark and deadly affairs. They are also important medicinals. Before asthma inhalers these plants were often used in the same fashion, though inhaled as smoke. Still today, we get crucial medications from these plants like atropine and scopolamine. Although widely associate with Italian food, Tomatoes (Solanum lycopersicum) first came from South America. It is widely believed that they were first cultivated as an exotic ornamental and thought to be poisonous before they became a staple cooking ingredient and primary garden “vegetable” (it is the fruit, technically, that we eat from the Tomato). Wood Nightshade (Solanum dulcamara, also known as Bittersweet) helps to show why Tomatoes were once thought to be poisonous, as it has small, poisonous, red fruits that look very much like Tomatoes. Black Nightshade (Solanum nigrum) is still believed by many to be deadly poisonous, though it was once promoted as “Wonderberry” in seed catalogues. Common knowledge of the plant has been growing due to the popularity of Samual Thayers’ Nature’s Garden in which he discusses Black Nightshade and similar writings. But still, edibility is not always clear and many diets (such as macrobiotics and anti-arthritis diets) recommending the near complete avoidance of Nightshades. So, understanding poisonous plants will take some time and study. The investment comes with the reward of knowledge that could save a life through prevention. So start small, with the study of plant families and the identifying characteristics of the most poisonous species. Maybe you noticed the word “Bane” in the names of plants in these families. That is an indication of poison. Apocynaceae has Dogbane. Runuculaceae has Baneberry, Bugbane, and Wolf’s Bane. Asteraceae (the Aster Family) has Fleabane (Erigeron spp.) and the list goes on. Throughout the lore of plants, include in their names, has been woven the knowledge of toxicity. Such is its importance.